Willimantic Records: Three killer live shows here at Willimantic Records on Sunday, Monday & Tuesday! 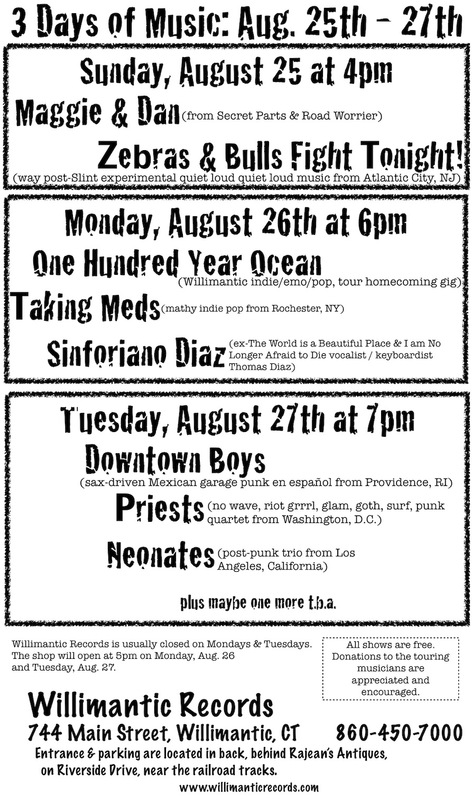 Three killer live shows here at Willimantic Records on Sunday, Monday & Tuesday! ZEBRAS & BULLS FIGHT TONIGHT! All shows are free with donations to the bands encouraged and appreciated. Usually Willimantic Records is closed on Mondays & Tuesdays. The store will open at 5pm on Monday, August 26th and Tuesday August 27th.